Applied Maths is more than just Mechanics and Statistics. The MEI board recognises Decision Maths and possibly Differential Equations, Numerical Methods and the increasing possibilities of computational Mathematics. OCR agrees with the Decision Maths. • Computational sciences which includes numerical analysis, linear algebra and linear programming. This breakdown has no obvious place for discrete mathematics (as opposed to the continuous mathematics exemplified by calculus and analysis). I’d place it in applied maths rather than pure, but it seems to be an ill-defined topic area. The link points to a list of topics that would be includable within such a title. 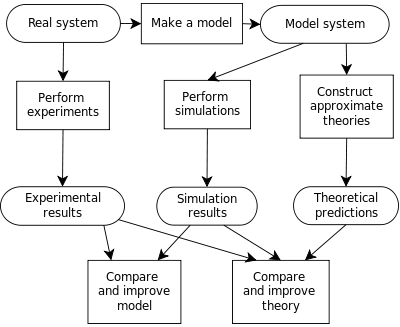 20180824 several diagrams added resulting from Google search for (i) maths modelling diagrams such as MEI used to use and (ii) the learning cycle. I’d have liked having something along these lines in my classroom.